Sign holds up to four (4) 4.5" numbers OR up to eight (8) 2" numbers. Please type the numbers you desire in the box above. Small images (from left to right): AB antique brass; AC antique copper; BS black plaque with silver characters; BW black plaque with white characters; GG dark green plaque with gold characters; OB oil-rubbed bronze; OG bronze gold; PS pewter silver; RG red plaque with gold characters; and WG white plaque with gold characters. 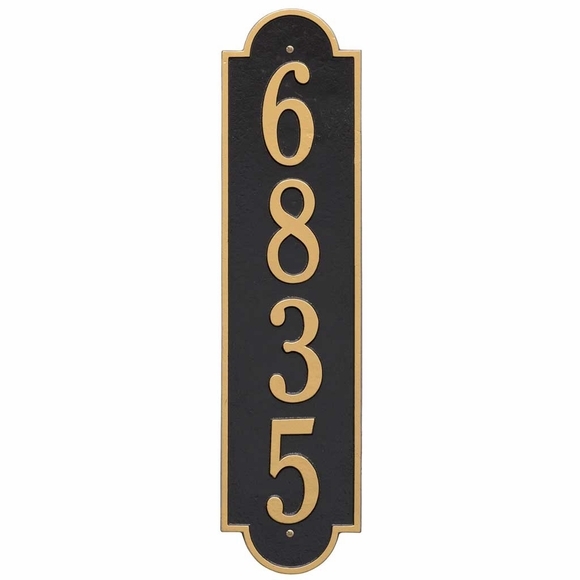 Additional Vertical Address Signs are shown in Related Products.